There is rarely any upside to a human being being assaulted. However, in this case, a violent incident between two female Irish ex-lovers has resulted in what might possibly be the mother of all accurate newspaper headlines since Gutenberg invented the printing press. While the headline succinctly tells me the important facts, the article itself doesn’t answer all the questions that the headline raises. 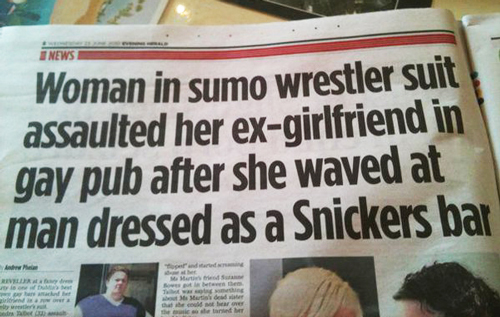 For example, was the victim dating (or hoping to consume) the man in the Snickers outfit? Did she switch teams because she found the Snickers more satisfying? Or was her ex-lover just angry at the symbolism of waving at a product whose slogan is “Get Some Nuts”? Strangely, the article states that the pub was hosting a “fancy dress party.” Do the Irish wear sumo wrestler outfits to a “fancy dress party”? If true, that would be ironic since my sumo wrestling cousins dress up as leprechauns for their formal soirees. I don’t get what’s so odd about wearing a costume to a costume party. The article does says “fancy dress party” (British/Irish English for “costume party”), not “white tie” or something similar. big savings on your utility bills at the end of the year. Landfills are designated areas to gather municipal solid waste. products you were looking at.